Leading Manufacturer of bench model electronics weighing scale, budget table top electronics weighing scale, miniature table top electronics weighing scale, optimum table top electronics weighing scale, platform electronics weighing scale premium and platform model electronics weighing scale economy from Chennai. We are acclaimed as one of the notable names in the market, highly involved in providing a wide array Bench Model Electronics Weighing Scale. Our products are highly in conformance with the quality standards and norms and delivers reliable performance in varied industrial applications. These are popular for their durability, accuracy, sleek design and compact size. Battery, Load Cell, Mother Board, Transformer, Power Cord, Switches And Frc Cable. Call Acurel For Information On Accessories And Spare Parts. We being a distinguished bu siness company are highly dynamic in providing to the industry a vast gamut of Budget Table Top Electronics Weighing Scale. This scale has the big size and is provided with one regular display and second display on the pole. This scale has the inbuilt battery charger with the battery and is reliable for years. Our client gets to choose from a wide range of options at very reasonable price. 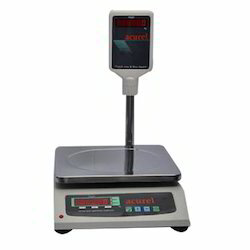 Our client can avail from us an exclusive range of Miniature Table Top Electronics Weighing Scale. The base design of mechanical and electrical and electronics weighing machine ensure durable and reliable performance of the machine for various applications. 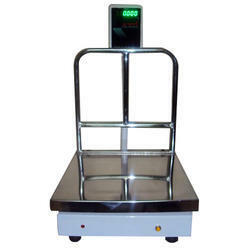 We have manufactured these electronic weighing scales employing highly advanced machines & technology. We feel pleasure to introduce ourselves as the foremost firms of an Optimum Table Top Electronics Weighing Scale Our offered products are tested on our globally approved parameters in order to ensure the quality, durability and strength of the product. Clients can avail these products at market leading prices. Display Size 0.56" / 0.8"
Owing to the efforts of our dedicated team of professionals, we have been constantly engaged in offering the best quality Platform Electronics Weighing Scale Premium. It is easy to use as the object to be weighed can be just put on the platform and an accurate result can be obtained in no time. Our object is available in varied sizes, models and weighing capacities as per the different demands of the clients. 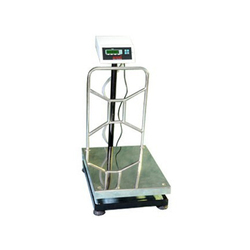 We are engaged in manufacturing and supplying a world class range of Platform Model Electronics Weighing Scale Economy. Keeping in mind the varied necessities of our esteemed patrons, we offer the entire range in different sizes and other related specifications. In order to ensure the quality of this scale, quality controllers perform a series of test against various parameters. Besides, this scale is used to measure heavy load. 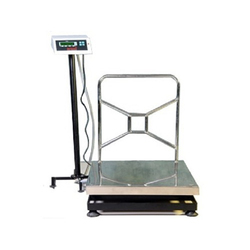 We are engaged in providing our clients with Chicken Model Electronics Weighing Scale that is widely used in construction, defense and education areas. These scales are thoroughly inspected on numerous measures of quality by our specialist. Our scale is dimensionally accurate and is manufactured as per the latest industrial norms. The OHAUS Defender 2000 Series of bench scales offers OHAUS’ signature accuracy for commercial andindustrial weighing applications at an unbeatable price. Depend on the OHAUS Defender 2000 Serieswhen you need accuracy you can count on while maximizing your budget. Sturdy Industrial Design that Can Stand Up to the Rigors of Industrial Weighing—Thepolished 430 stainless steel platform with painted carbon steel frame and aluminum alloy IP65load cell provide strength and durability. Easy-to-Read Red LED Display Can Be Viewed in Even the Dimmest IndustrialConditions—Defender 2000’s red LED indicator clearly displays results that can be seen in locations with less than optimal lighting. Versatile Power Capabilities Provide Unrestricted Operation Wherever Your WeighingNeeds Are—An AC adapter and internal rechargeable lead acid battery provide options for powering your Defender 2000.